It is important to be in control of your assets even if you are absent from business for whatever reason. A power of attorney for finances enables you to authorize an agent to perform a broad range of financial and property transactions for you. This can include paying mortgage and utility bills, managing real estate, investing, applying for benefits, conducting litigation, and other tasks. You can generally authorize the agent to perform all of these merely by selecting each one on the form. Vermont requires you to specifically authorize the agent to perform certain activities, such as selling your real estate, making gifts with your property, or accepting payment for his services. This is a safeguard to prevent agents from wielding such powerful authority over principals’ assets unless they specifically want them to. However, in Vermont you may not entitle your agent to revoke, execute, or modify wills or living wills for you. 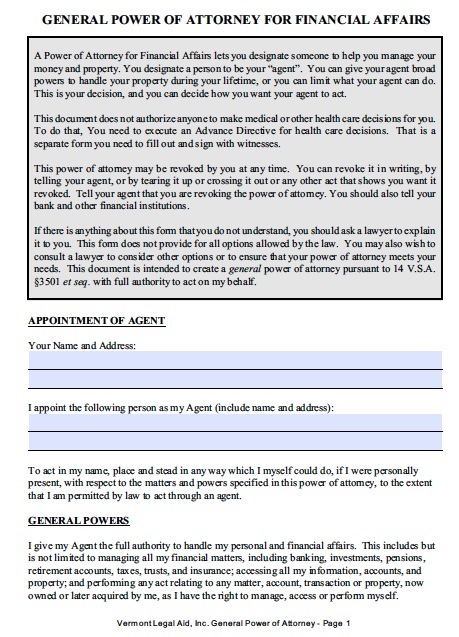 You can tailor the document to allow the agent to do only specific tasks. For example, you can allow the agent only to sign documents for you to close a real estate deal. This type of arrangement is good if you know in advance when you will not be able to attend to your business.